One of my favorite Christmas decorating tips is one that you probably wouldn’t even think of… Coordinating your Christmas tree and gift wrap! While this may seem too tedious or like a silly little thing, you would be amazed at the difference it makes. There are many benefits of Christmas coordination. 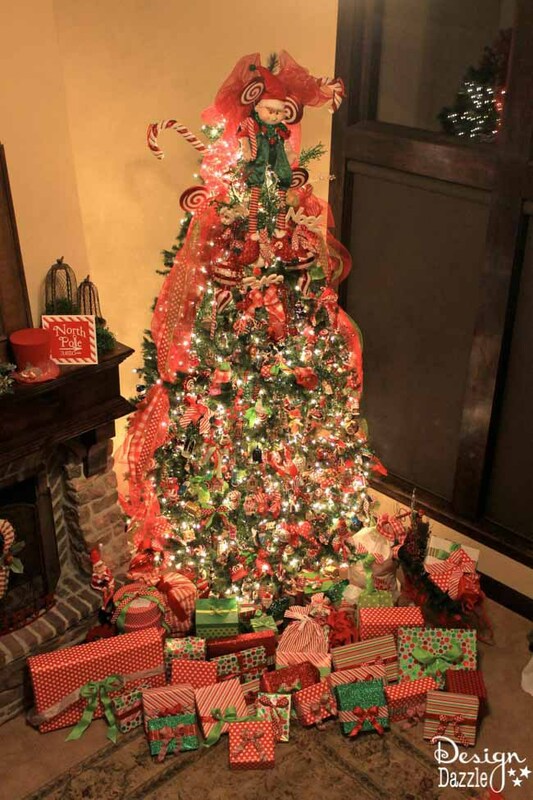 Coordinating your Christmas tree and gift wrap gives the whole set up a more polished, finished look. It also is a great motivation for wrapping your presents earlier! To give you some festive inspiration, I’ve gathered a few of my favorite trees with coordinating gift wrap from the past few Christmases. I hope you find some ideas to help you get started! 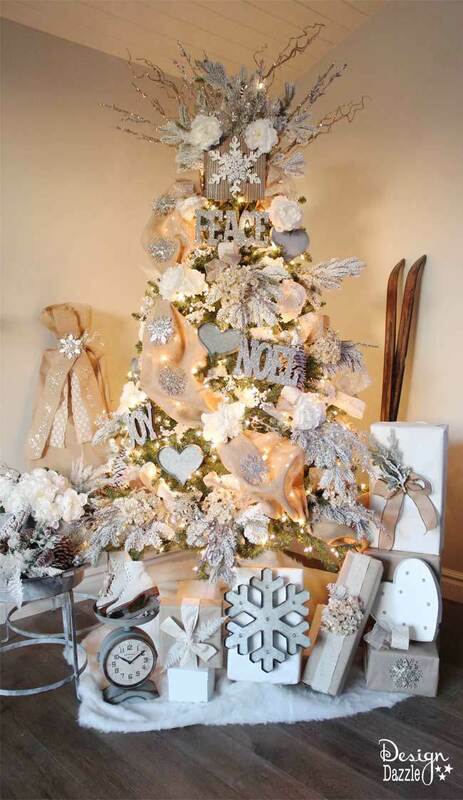 This is my Winter Wonderland Glam Tree this year. 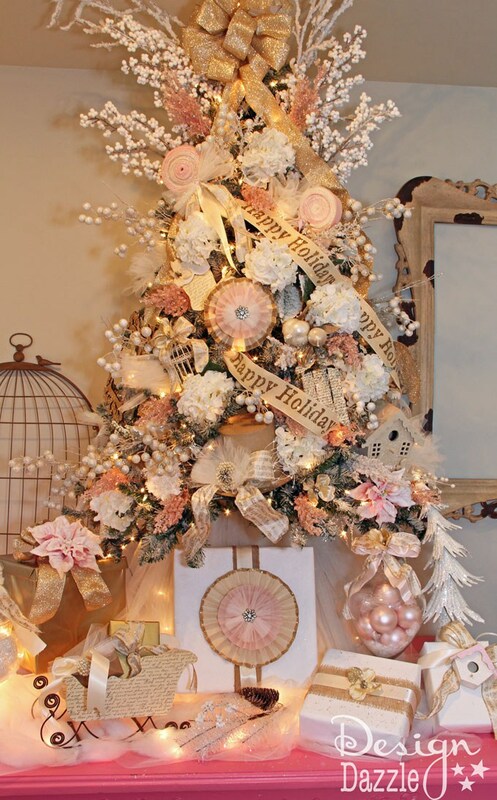 I love how the embellishments on the presents really stand out with the neutral colors! White and brown kraft paper are my go-to for wrapping presents. I also look around the home for home decor that could be used to decorate under the Christmas tree. I had to get pretty creative with this gift wrap. All the materials were from Home Depot, believe it or not! Check out this post to see how I did it. I love how it matches this tree perfectly. This is last year’s Santa’s Cabin in the Woods Tree with neutrals and plaid that make me feel so cozy. I used the same ribbon on the tree and on presents so it totally matched! This is my Jeweled Forest dream tree from 2013. Once again, I continued my theme from my tree to my gift wrap. It’s the little touches that make all the difference! Here’s my 2012 vintage shabby chic dream tree. 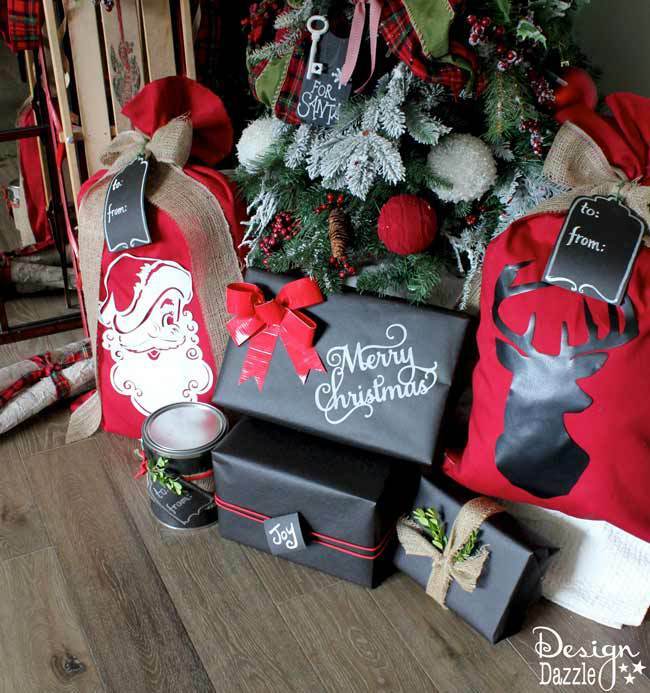 Coordinating gifts and your tree is so easy! 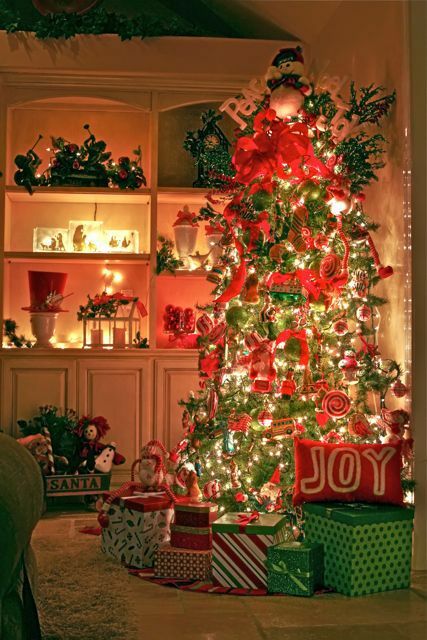 This tree is more traditional with red and green, candy cane stripes, and complete with elves! You can’t go wrong with these classic Christmas colors. My daughter loves wrapping presents, and she might have gone just a little overboard a few years ago! She wrapped every little thing she could. Don’t they look beautiful?! Here is our Family Memory Tree from way back in 2009. You can coordinate just about any tree, even one where most of the ornaments are pretty mis-matched! 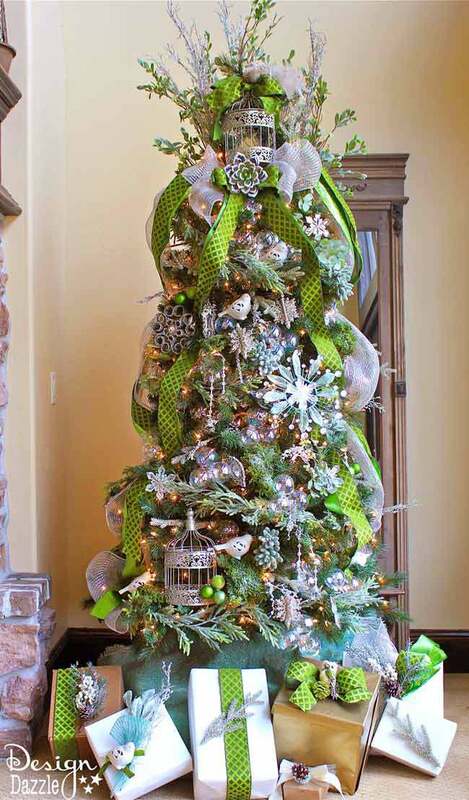 Ribbon is a great unifier when decorating with ornaments that don’t exactly match. 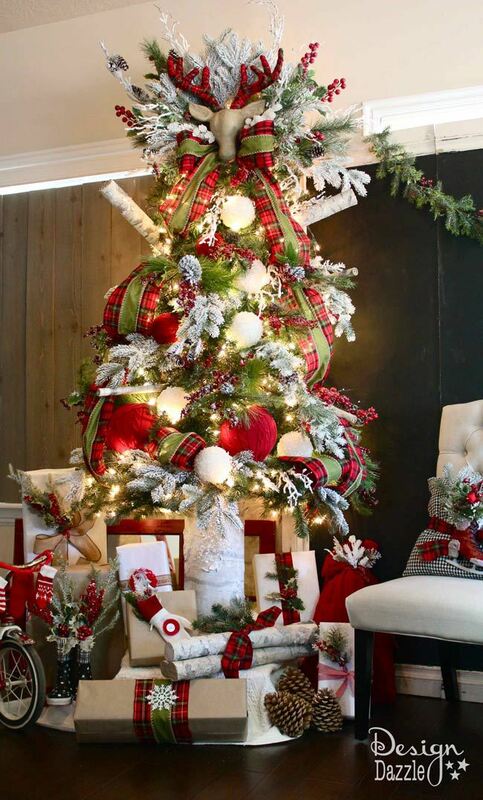 Use ribbon to “pull” the tree together as a decorating piece. As you can tell, I love trying new things with my Christmas tree each year. It is so fun to have a theme and find the perfect ornaments, ribbon, accessories, etc. to go together. 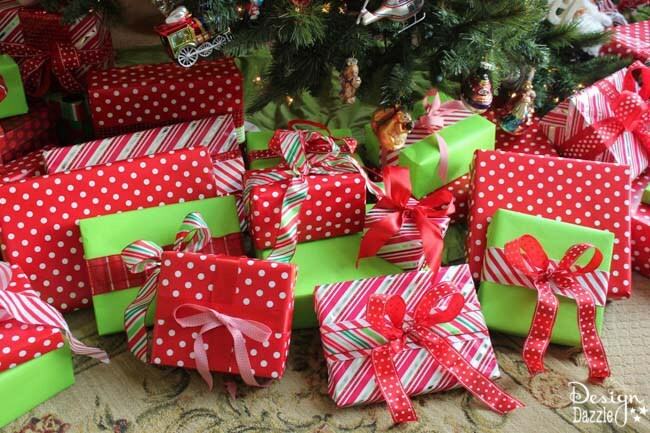 Coordinating your Christmas tree with your gift wrap will make all the difference and take it from pretty to professional! I can’t wait to see your Christmas tree and gift wrap!